Reconstituting the Market details many transition economies - some already well known, others enjoying very little attention from researchers - and a range of important issues to do with state building and its links with microeconomic transformation. The book was based on the authors' view that transition in the new states would be fundamentally more difficult than in more established states - a view which turned out to be incorrect, since in all the transition countries the former communist state had to be largely rebuilt as part of the complex process of constructing a market economy. 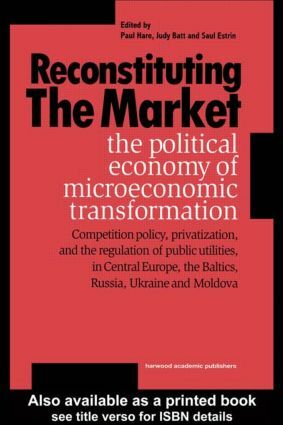 Aspects of this process, focusing on competition policy, privatization, and the regulation of public utilities, are examined in respect to Central Europe, the Baltics, Russia, Ukraine and Moldova. The result is essential reading for anyone seeking an up-to-date account of key transition issues, covering both familiar and unfamiliar countries. The Slovak Republic: Macroeconomic Success and Lagging Microeconomic Reform—How Long Can it Last? Economic Competition in the Transitional Slovak Economy: Creation, Promotion or Protection?